Vietnamese alphabet is pretty easy to learn and remember, at least to Westerners, since most of the letters belong or relating to Latin characters. It’s an interesting fact that, in the eastern Asian region, Vietnam is one of a very few nations that use Latin characters in national alphabet system. The neighbors like Japan, Korea, China, Laos, Cambodia, Thailand, Indonesia, etc. all use logographic scripts. That said, Singapore may be an exception. The Merlion Island nation uses several official languages including English, Malay, Tamil, and Mandarin. The first two are Latin based, but the others are logographic. Centuries ago, our ancestors also used the alphabet of Sino-Vietnamese (chữ Nôm), which is similar to Chinese scripts. Since 17th century, Portuguese and French priests, among who was Alexandre De Rhodes, successfully set up the Latin-based characters to record Vietnamese language. 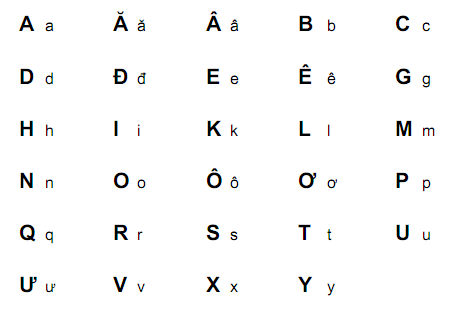 It was followed and developed to nowadays our alphabet. Our alphabet has 29 letters. 22 of them are the same with English. The other 7 are derivatives: ă, â, đ, ê, ô, u, and ư. In fact, the alphabet system doesn’t include f, j, w, and z, though we do use those letters commonly in certain areas, say geometry, informatics. Actually, once there was a debate about whether to officially include those into the national alphabet. Yet the proposal was not approved finally. How are you? - Bạn có khỏe không? You can see besides characters, above sentences also have marks above or below vowels. Those decide the pronunciation tone and meaning of the words. If you care to learn further, I recommend you to attend a formal class, and visiting dedicated leaning-Vietnamese websites. In your study process, if you need assistance or have questions about my mother tongue, you can contact me at any time. For Vietnamese keyboard and fonts in computers, you can download and install software like Vietkey or Unikey. Following the usage instructions, you can type Vietnamese text in word processors. Having read above, do you think it’s hard to learn and remember Vietnamese alphabet? Please share your comments if any. Also, I hope you find useful information in this article. If you do, would you mind clicking Like to encourage me? Thank you!